The Archeological Museum of Chios was constructed between 1966 and 1971 in an area of 2500 sq meters. The building is comprised of exhibition rooms, storerooms, workshops and offices which cover an area of 1200 sq. meters. 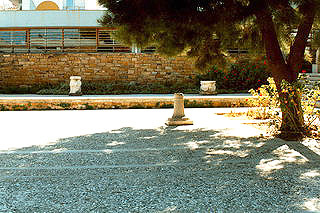 The Museum contains collections of prehistoric and archaic findings from excavations of the British School in Emborios, Neolithic findings of the British excavations in Aghio Galas, Archaic and Classical findings from the British excavations in Fana and various findings from the salvage excavations conducted by the 20th Ephorate of Byzantine Antiquities. Renovation was completed in 1998 and the museum was open to the public in November 1999. The Archeological Museum of Chios is proud to announce that it was nominated for the 2001 European Museum of the Year Award. Within a group of 120 European museums, 39 nominees were selected, including the Archeological Museum of Chios.